In celebration of National Public Health Week pay $1 a day to wear jeans April 2-8, 2018. All proceeds will go towards NDPHA. 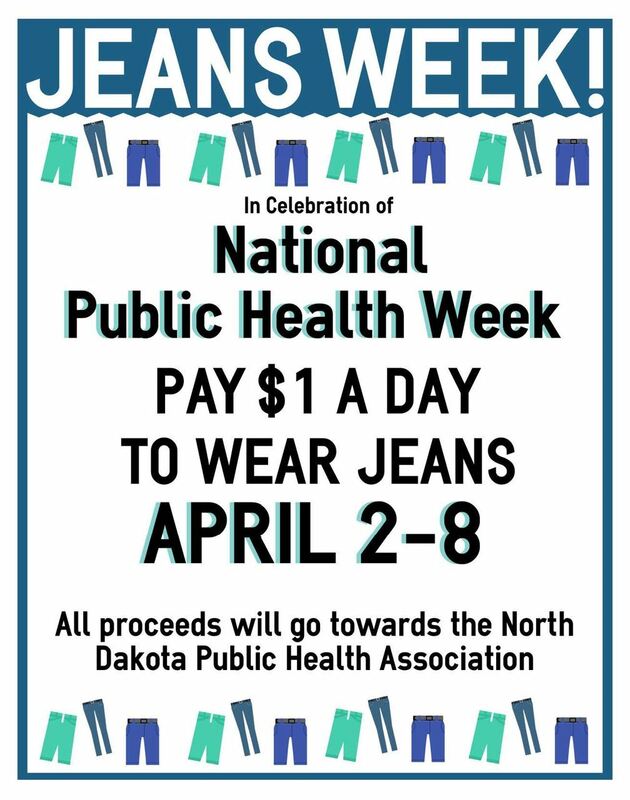 In celebration of National Public Health Week Pay $1 a day to wear jeans April 2-8. Quite simply, a Jean Day Fundraiser is when an office or business allows their employees to wear jeans to work for one day and in return the employee makes a small donation ($1 a day). Payment can be given to one individual in your office who will ensure the $$ raised get to NDPHA. ***To pay online there is an minimum payment of $5. All proceeds will provide support for our NDPHA student members to attend the Dakota Conference on Rural and Public Health. Click HERE for the flier. Please email if you have any questions. If your office is participating in Jeans Week please feel free to print these stickers to give to participants.